All pictures are courtesy of Pete from Pentaxforums. And I have purchased the Bowers adapter from BHPhoto that comes with the removal tool that I need to use in dismounting adapter from the k mount. Both of the above adapters are completely flushed onto the k mount and they have no issue with infinity focus. My personal experience with the Bowers has been positive though the first few times in dismounting is kind of awkward without the knowledge and information on dismounting. The Bowers adapter do not come with instructions. Please use the following pointers to get informed about the adapters. I have a KOOD adapter and tool which looks identical to the Bowers one. I've removed the little spring so the tool isn't needed. If I tighten the adapter onto the lens first, it unfastens the bayonet rather than unscrewing. Sometimes I then need the tool to get a good grip when removing it from the lens. Thanks for the valuable information. If I ever get a chance, I would buy another one to try the idea. It would be extremely useful to have converted all the m42 lens to a k mount as you have discussed. Other than the cost, I wonder if there is any issue on the conversion to be cautious about. I've seen a warning (somewhere) that some lenses protrude well into the body of the camera when at infinite focus. The mirror can crash into it when taking a photo. Not seen it myself, but I do look every time I try another lens. Thank you DavidN for the comment and note of caution. Just a tip. 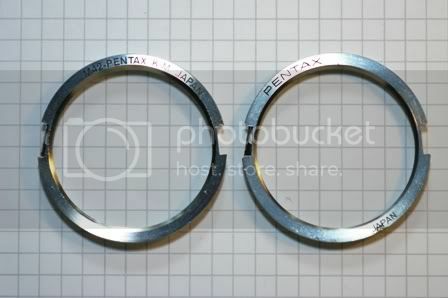 You can get PK end caps for Pentax lenses and these attach with a quarter turn. My DA lens has a push on end cap, but I bought some extra end caps as spare. The turn end cap effectively have plastic end stops in them which engage the bayonet lugs. 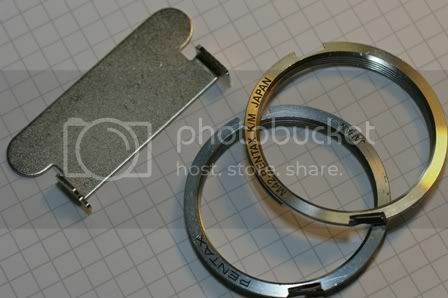 It is a lot easier to use such an end stop to attach or detach the M42 adapter from a lens. You get far more grip than the tool that comes with 3rd party adapters. I've read many comments around the web that the Pentax M42 adapter is hard to find so people are buying 3rd party adapters. They really aren't hard to get. The problem is that Pentax considers them parts rather than accessories. I found out how to get one by contacting Pentax customer support and was given a number to call to order one. I did that last Friday and should have it today or tomorrow. It was $22 Canadian plus taxes and S&H.